Girl Gone is an adventure for Cepheus Engine and other role playing games using a 2d6 mechanic, including the Original Science Fiction Role Playing Game. An expansion of an adventure hook from A Baker's Dozen of Inhabited Worlds, the PCs are asked by a comparatively wealthy merchant to find his missing daughter. The adventure is set in Warren, as asteroid with a dubious reputation, variable legality and a place where anything and everything can be purchased, if you know who to ask. The daughter, Jessica, was abducted after she left a club with a member of a local gang, the White Masks. The Masks are into organ-legging and slaving, with a sideline in selling their victim's possessions. Jessica is a high value item for them, and she is going to be sold in a private auction. The PCs will need to track Jessica to the White Masks' base and save her. The adventure includes a black and white map of the White Masks' lair in two versions, one for players and one for Referees. One page is the cover, one the front matter, one the Open Game License and two pages are the two maps of the White Masks' base. I got an eMail saying this was pay what you want but once here, I'm asked for $3.18. Am I the only one? Is that a glitch or a mistake? It's some sort of glitch I think because I didn't send that email. When did you get the email, because the only one I sent I sent on Saturday. It could be related to the site's migration to the cloud; I would suggest contacting DriveThruRPG about it. Also, the price of $3.18 you saw - is that in US$? I'm checking, because that isn't actually its US$ price. Thu 2/7/2019 2:56 AM is the date on the notice, in the 'Here are your 'Follow Your Favorites' updates for today!' 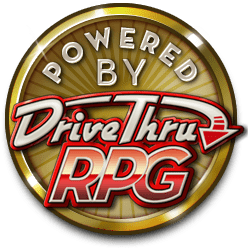 eMail from 'DriveThruRPG.com [no-reply@drivethrurpg.com]'. In Australia, that was yesterday. Just wanted to give you a heads up pretty much. It also happened with titles from other publishers (though this was the only one I actually looked at until just now checking dates out of my deleted email folder that I haven't cleared yet); Foreven Worlds Single Ship: Reidian Flyer Blockade Runner (MGT 2e) From Jon Brazer Enterprises, Ice From Michael Brown, The Between From Michael Brown, and 1223 Gram (Spinward Marches) From Mark Ferguson (whom I obviously didn't message because I only just looked). Thanks, it looks like it was an automated email from One Book Shelf then; I didn't even know there were "Follow your favourites" emails!. Which I think means it's an error tied to the site migration - there have been more than a few problems related to the publisher side. I would suggest letting OBS know and I will do the same. I have heard back from OBS and yes, it was an issue on their side where a number of emails listed products at an incorrect price.